Every trip to Baguio comes with unforgettable memories that stay with you for a long time. Harness these moment and get a chance to win an overnight stay for two at the Holiday inn Baguio City Centre. 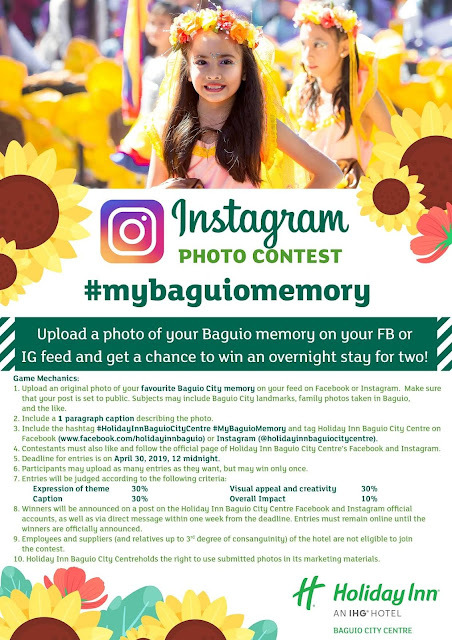 Just upload a picture of your favorite memory in Baguio on Facebook and Instagram – it could be a family photo, a landmark, a favorite moment – with a one-paragraph caption to describe the photo. Include the hashtags #HolidayInnBaguioCityCentre #MyBaguioMemory and tag Holiday Inn Baguio City Centre on Facebook (www.facebook.com/holidayinnbaguio) or Instagram (@holidayinnbaguiocitycentre). Only contestants who like and follow Holiday Inn Baguio City Centre’s official Facebook and Instagram will be eligible for the prize. Deadline of posts is April 30, 12 midnight. Contestants may post as many entries as they want so don’t hold back and relive those special moments! Winners will be announced on Holiday Inn Baguio City Centre’s official Facebook and Instagram pages, and via private message. Entries must remain online until the winners are officially announced. To learn more about the hotel, visit www.facebook.com/holidayinnbaguio or www.holidayinn.com/baguio. For booking inquiries, call (074) 620-3333 or (632) 571-6079 or email reservations.hibaguio@ihg.com. Holiday Inn Baguio City Centre is a family-friendly hotel that also features three versatile meeting rooms: Bag-Iw Ballroom, Karao and Isneg, and a 24-hour fitness center for registered guests. Along with its three sister hotels in Metro Manila, it is managed by IHG® (InterContinental Hotels Group), a global organization with a broad portfolio of hotel brands in its name.